Take a walk with your dog(s) or just look out the window and capture the sky in your knitting. What a cool idea! I link-hopped and landed on Lea Redmond's Conceptional Knitting web site. She creates projects that, she says, embody activities that push you to be observant and contemplative and through them, create something not only functional but meaningful. So, for 2012, I am going to give her Sky Scarf a go. 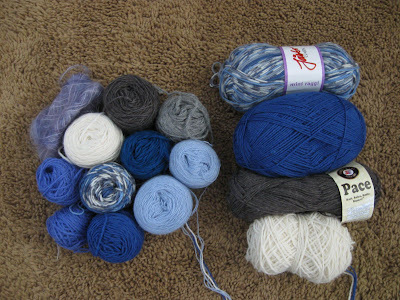 The Project: First, collect yarns in the colors of the sky—light blue, bright blue, grays for the rainy and overcast days, white for clouds and snow, etc. Cast on. Go outside and look at the sky, and knit the color of the sky that day. 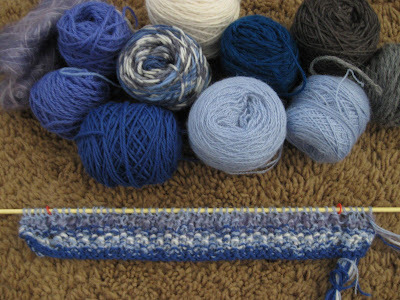 Lea suggests knitting 2 rows (there and back) each day so you get back to where your working yarns are. By the end of the year [or season, or time whatever time period you choose] you will have created a scarf that reflects the changes in the sky. I'm using project left-overs and yarns from my stash—mostly sock and lace weight. With 365 x 2 = 730 rows, it could get quite long with heavier yarn. The fiber content consists of superwash wool blends and some 100% alpaca. CO 49 on size 4 needles. I'm using seed stitch over an odd number so I always start with a Knit stitch and I put a 3 stitch garter edge with an eyelet for the side borders. What a simple, creative and meaningful project. You could adapt this to just about anything. You don't need a pattern as nature will direct your course. Give it a try!